DABmotion is an in-car audio adapter that offers a flexible and effective method to integrate digital audio to your existing AM/FM in-car audio system. Your existing AM/FM audio system can be easily upgraded to receive DAB/DAB+ digital radio services when you install the DABmotion. 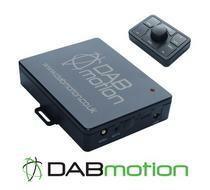 The DABmotion interface connects to your in-car audio system by wireless utilising a FM-RDS micro-transmitter. No complex wiring is required and DABmotion does not interfere with any of the existing car wiring circuits. DABmotion is operated using a wireless RF remote controller and messages that relate to DABmotion operation are displayed on the screen of your in-car audio system. The flexible configuration options of the DABmotion make it easy to install in any vehicle. DABmotion needs an RDS car radio in order to properly display the relevant information via the in-car radio display. Advanced automotive interface that provides fantastic digital radio reception through your existing vehicle audio system. Fantastic Device just fitted the device to my Landrover Freelander 2. Mounted the unit above the radio behind the Facia as there is no other suitable location. Put Glass mount aerial on left rear quater window and get a great reception as according to uk digital radio i should not be recieveing any stations. Excellent product, easy to fit, put mine behind quarter panel in boot of mondeo estate and hard wired it using supply to 12 volt socket. Would recommend product and service from the car audio centre. Please call your local store to get installation cost.